Iowa has a rich natural heritage comprising hundreds of species of wildlife and a wide diversity of habitats. An estimated 206 species of birds have been documented to have used the state to nest and raise young, and nearly 200 more species have been documented passing through en route to northern breeding ranges or southern wintering areas on annual migrations. Some 80 species of mammals have been documented in the state, including settlement-era reports of large herds of bison seen statewide (last documented in 1870) and the 20th century success story of the return of the white-tailed deer, from complete absence at the turn of the century to one of our most conspicuous and abundant wildlife species in the state. There have been over 70 species of reptiles and amphibians documented in Iowa as well, occupying sunny logs and wet pools on warm summer days in every corner of the state. From the wooded hills of the Mississippi to the wide flood plains of the Missouri, Iowa's diverse landscape plays host to wide variety of ecosystems in which these wildlife thrive. In some places, these ecosystems, like prairies or deciduous forests, remain in large tracts managed by public agencies to protect their ecological integrity and provide recreational opportunities for Iowans. Most of our remaining natural areas however are not found on large tracts of publicly managed lands, but rather found interspersed with working agricultural lands or urban areas on privately owned lands. These areas, from backyards to the back forty and beyond, are the key to ensuring future generations of Iowans will be able to enjoy the call of the bobwhite, the sight of a white-tailed deer fawn, or the melody of robins in spring for years to come. This website, and the Wildlife Extension Program at Iowa State University is committed to helping interested landowners and community groups identify these areas, learn about the wildlife that rely on them, and find resources and information about how to improve or create wildlife habitat on their own land. Find ways to manage your working agricultural lands for wildlife, without impacting the bottom line. Perhaps the biggest misconception in wildlife conservation and land management is the idea that you can have either a productive farm or a farm for wildlife, but not both. Experiences of producers and wildlife conservationists across Iowa and the Midwest prove otherwise. Visit our page for farmers and ranchers to learn about finding and creating opportunity areas for wildlife on your farm or ranch today. You don't need 640 acres of land to help Iowa's wildlife. Learn about managing your backyard, or any space for wildlife. Wildlife are found in all shapes and sizes and in all corners of Iowa. Sure, some so-called area-sensitive species, won't make much use of your native flower bed, but other, beautiful birds, insects, reptiles, or mammals may find your corner of the world just right. Visit our page for homeowners to find resources to make your landscaping and home more attractive to wildlife all year round. 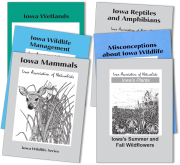 From 1993 to 2002, Iowa State University Extension and Outreach wildlife specialists collaborated with the Iowa Association of Naturalist and other natural resource professionals in the state to develop a comprehensive series of articles on Iowa's natural environments. The series included 40 individual articles in seven general categories that covered topics ranging from basic plant and wildlife identification and biology to environmental and conservation challenges. Though some of these articles are out of date, many still serve as outstanding references for learning about Iowa's ecosystems and the plants and animals that inhabit them. See the titles and download full articles here. Download this free comprehensive guide to the mammals of Iowa from the Extension Online Store. This series of articles, developed by wildlife extension specialists at Iowa State, provides resources for landowners interested in restoring habitat on their land.